I love this time of year. Who can resist mulled wine, warm fires, cozy sweaters and cold evenings? Not this girl. The whole season kicked off for me this week. I met a friend at the Southbank Winter Festival on Monday evening where we ate hog roast, drank hot wine (wasn’t really mulled…but they tried) and bought Chrissie presents (for ourselves mainly…). On Sunday I’m having ten of my closest friends in London over for a Thanksgiving feast-ival. Thanksgiving is all about bringing people together, making a potluck with lots of warm and very fattening food and drinking wine, brandy and really anything else you can get your hands on. My contributions to the feast this year will be hot-pot mulled wine and a warm cheese dish (of some sort…). One of my friends has a smoker (yes, he immediately went out and bought it when he moved to London from Texas a few months back…I don’t think they have a can opener but by goodness they must have a smoker!) so we will have proper Texan smoked ham. Another friend is from South Carolina and will be contributing her families sweet potato dish of deliciousness. Everyone has their favourites. I’m going to break out a few bottles of my French Burgundy that I picked up during my trip in October. I’m excited to see how it goes with all the gorgeous homemade foods. Mostly I’m just excited about having people I love in my home: dancing, chatting, laughing and preparing ourselves for the silly season ahead. I really do love this time of year. Pinot Noir is always a good bet. Ned Pinot Noir, NZ (£10) is a perfect selection. Lovenotes: Tasting Wines for the Holidays! 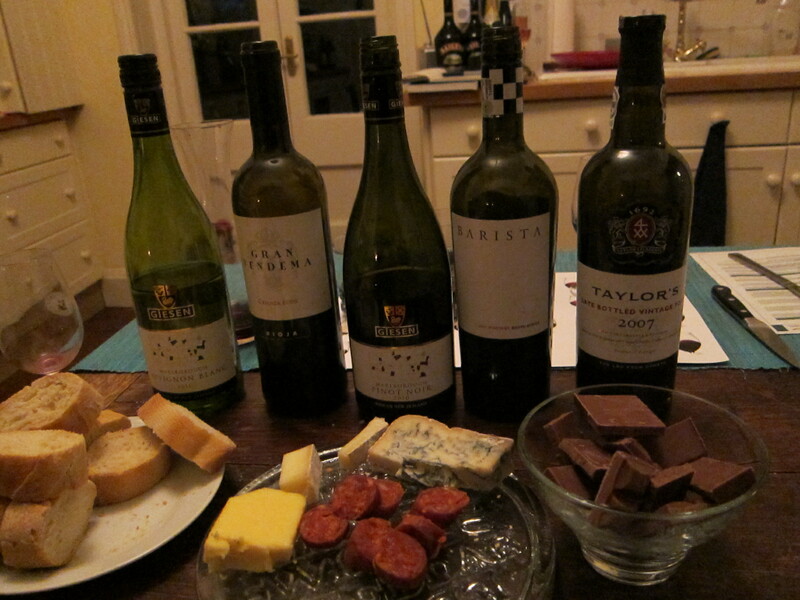 I hosted my second wine tasting at my flat yesterday and welcomed an intimate group of lovely new friends into my home. We tried wines from around the world – with personal stories from the group to match! I have posted pictures of the wines below as well as some notes on our reviews. Please excuse the quality of the pictures – my lovely photographer friend, Jackee, is on holiday so I took them myself (yikes!). Everyone left slightly merry with a lot of laughter which is exactly how I like it. Around the world with one grape – find the same grape from different regions around the world and try them all together. Sherry is not just your Grandma’s drink – this one I will find more challenging as Sherry is not my favourite but alas, when the crowd wants it the show must go on. If you want to join in on the fun, sign up for a future tasting or drop me a note. If you’ve been hoping to increase your knowledge and awareness of amazing wines this holiday season, make sure to sign up for some upcoming tastings. Spots are still available and cost is either by donation or £10 (until 11th Nov). Its a great way to get a handle of what types of wine will impress your friends and family as well as yourself this holiday season. For the Nov 17th tasting, so far we have a yummy Port, some gorgeous Bordeaux, a few South African stunners and maybe even a cheeky Bierzo. Sign up today! What better time to get up to speed on what wines you like, love and covet than when you are preparing for upcoming festivities with family and friends? There are a million ways to start brushing up on your skills: Head to your local supermarket/wine shop and ask lots of questions (many times they will have tastings available while you browse – just ask), Attend a tasting (lots of places offer tastings – speciality shops, wine shops, liquor stores, etc. Keep your eyes peeled), Talk to your friends (many people have a favorite bottle of wine that they use as their ‘go to’ tipple for any celebration. Ask people you know for suggestions and you may just discover a new gem!). For my part, I will be hosting, attending and conversing about all things wine in the next two months (have a look at what I’m up to here and sign up if you’re interested). As always, if you want to swap ideas – pull up a chair and let’s chat. I started off the weekend with a hike in Surrey with my good friend. Just a 40 minute train ride from London Victoria and we were in the countryside, bathed in fall colours and surrounded by rolling hills. The wind has gotten really cold this past week and we were very much unprepared for just how chilly it would be but the fresh air and gorgeous scenery made for a truly enjoyable trip. 5 miles later, we gratefully plunked ourselves on the warm train back to London. Our friends were getting together for a Halloween party later on in the day so we parted at Victoria in order to head to our respective homes and get ready. Even though I was freezing, I love being able to walk around the city when I have time so I decided to wander back to Battersea on foot. I took advantage of the great little food shops on Warwick Way and Lupus Street and picked up a few nibbles for my afternoon at home. While the fresh pesto and pecorino was ooey-gooey deliciousness, the stunning part of my afternoon was opening up this gorgeous South African Chenin Blanc that I had received as a gift from a dear friend. 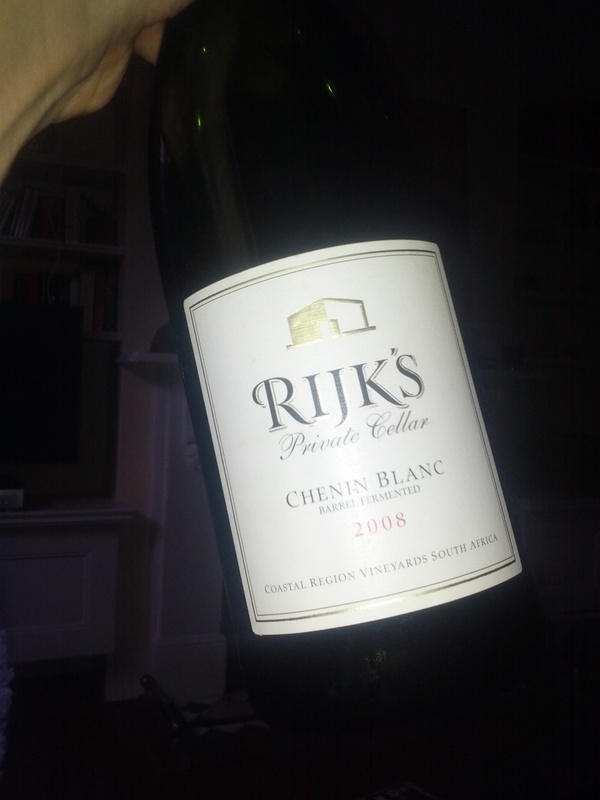 I have not explored South Africa very much and after tasting this wine, I have realised that I need to get cracking. This wine is best described as pure elegance. Instead of waxing lyrical about the tasting notes, I am just going to steal a quote from ‘All About Wine‘: “Arguably South Africa’s top ‘Award-Winning’ Chenin Blanc is purity itself! A sumptuous, flavourful Chenin from this excellent Tulbagh estate, which manages to combine richness with a delicate, elegant palate.” It isn’t cheap but nor is it overpriced at £17. It would be perfect with a Sunday lunch and would impress the socks off any Chardonnay lover. I know a lot of people in jobs that they are just not happy with. They are looking to change, mould or just scrap the whole thing in favour of finally pursuing something they are passionate about. I also know people that have long since gone on that pursuit, many to find a greater happiness and fulfillment if not a bigger pocketbook. Many come back to their careers at least part time but others find a way to sustain their newly passion-filled life. I am a big proponent of following your passion. Nearly everything stands in your way when you are forging the path – people don’t believe you are making the right choice, the risk feels just too big, your other life plans don’t align, you don’t feel like you have the time, etc. This morning, I am focusing on what I love and taking another step towards my passion. Who’s coming with me? I have been asked by my lovely artist friend, Blair, to choose a wine for her upcoming currated art show in Shoreditch. She has selected a theme for the tasting: ‘Go Bananas!’ and I am meant to select a wine that is both in line with the theme and an artist’s budget. I am tasting a few options this weekend and will let you know what we end up selecting. In the meantime, if you’d like to learn more about the show check out the details at www.hatchedgallery.com. Her show opens on the 11th November and runs Monday through Friday, 10AM -6PM, until the 2nd December. I am also going to host a full wine tasting out of her gallery at the conclusion of the show on December 2nd. If you are interested in attending, drop me a line. Sign-ups are taken for £10 pp until November 11th, £15 pp thereafter.